Landis also witnessed that the man was being buried feet first into a deep grave, an unusual way of burying. Landis began to think to himself what would happen if you were face to face with someone who was already dead and there was no defense against it? As a young PA and stuntman in the business, he wrote a rough draft of American Werewolf and shelved it for over a decade and then decided to make the film once he had become an established director. David Kessler (Naughton) and Jack Goodman (Dunne) are two American students who are on a backpacking trip through Europe. The two men begin their vacation in Northern England where they come to the town of East Proctor. The two men enter a pub known as The Slaughtered Lamb looking for food and possibly a place to bed for the night. Upon entering the pub the patrons all stop conversing and the pub goes quickly silent. Both Jack and David ask permission to come in and the barmaid gives a nod. David and Jack begin talking to themselves and feel that something is a miss with the villagers. Jack looks over to one of the walls and sees a five-pointed star between two lit candles. Jack tells David that the star is used in witchcraft and that its purpose is to ward off evil spirits. David and Jack are met with hostility by the villagers and are quick to leave. The barmaid pleads with the rest of the villagers to let David and Jack stay. Two of the villagers tell David and Jack to “beware of the moon lads” and to “stick to the roads, and keep clear of the moors.” David and Jack leave the pub and make their way down the road as fast as they can as it begins to rain. The barmaid pleads once more that they shouldn’t of let them leave and that they must go after them before it’s too late. All of a sudden, a spine tingling howl is heard as many of the villagers pretend they heard nothing. While walking down the road and talking amongst themselves over the night’s events, David and Jack inadvertently leave the road and get lost on the moors as they too begin to hear the distant howl of what they believe is a sheep dog. David and Jack become quickly agitated and vote that they return to The Slaughtered Lamb. As the sounds of a rather large animal are heard to be circling them, David and Jack take off running in the opposite direction. David falls and is helped up by Jack, Jack is attacked and in one of cinema’s most disturbing, most horrific scenes ever, Jack is torn apart by a giant creature as he screams in pain and immense agony while David takes of running for his own life. David is also attacked and wounded by the animal, which is then shot by the local villagers. David awakens three weeks later in a London hospital where he learns that jack was murdered and that he has sustained several injuries due to the attack of an escaped lunatic (the official statement from East Proctor officials). While recuperating in the hospital, David begins to fall in love with a young nurse Alex (Agutter) who is also attracted to David and feels sympathetic to his condition. One of my favorite scenes in the film is where David awakens one morning as he is preparing to eat his breakfast, and is confronted by the freshly decomposed corpse of Jack who informs David that they were attacked by a werewolf and that by the next full moon David will become one too. Jack tries to convince David to commit suicide before it’s too late and he kills others and makes them like Jack, an individual who was murdered in an unnatural way and is cursed to walk in limbo until the wolf’s bloodline is severed. My second favorite, and one of the greatest scenes ever filmed in a horror film is David’s transformation scene that was created by legendary make-up FX artist Rick Baker. After thirty years, which predates any of today’s digital effects that would have been done today for a fraction of the cost a look cheap and fake, Baker’s FX are truly magnificent and are still effective in the age of HD. David’s metamorphosis into the werewolf is frightening, painful, and exhilarating to watch. In an interview, Landis said the transformation scene as a metaphor for puberty and male teenage angst. Soon after, David discovers what he has become and the film’s conclusion is nothing short of brilliant. American Werewolf was made in England in 1980-81 for ten million dollars and went on to gross over sixty million worldwide and gained a huge following. The members of the Academy of Motion Pictures Arts and Sciences were so impressed by Baker’s FXs that a special Oscar was awarded that year for his work, and the award has been apart of the Academy Award ceremonies ever since. 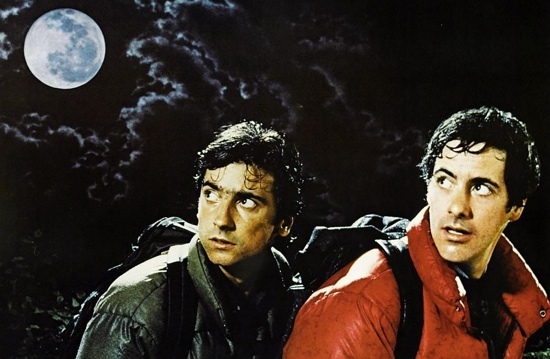 An American Werewolf in London has always been a favorite film of mine and continues to entertain me into my mid thirties. It was a film that terrified me at an early age, and makes me laugh as a warped early middle-aged man. Landis has always been in my top echelon of favorite directors and his unique style has always influenced me as a film buff and aspiring filmmaker. What I also love about the film are the constant cameos of actors like Frank Oz who plays an American diplomat who visits David in the hospital and later is seen on TV as the voice of Ms. Piggy in The Muppet Show as we witness a flashback scene with David and his family. British actors Brian Glover, David Schofield, and future comedian Rik Mayall (BBC’s The Young Ones) are also featured as villagers in the Slaughtered Lamb scenes. An American Werewolf in London is available on both DVD and Blu-Ray disc thru Universal Studios Home Video.